“For a long time I have been convinced that I could take a person with a high school education, give him or her a six-month trade school training, and provide a pastor who would be satisfactory to any discriminating American congregation. The curriculum would consist of four courses. Course III: Efficient Office Management. There is nothing that parishioners admire more in their pastors than the capacity to run a tight ship administratively. If we return all telephone calls within twenty-four hours, answer all letters within a week, distributing enough carbons to key people so that they know we are on top of things, and have just the right amount of clutter on our desks – not too much or we appear inefficient, not too little or we appear underemployed – we quickly get the reputation for efficiency that is far more important than anything that we actually do. Eugene H. Peterson. Working the Angles: The Shape of Pastoral Integrity (Kindle Locations 72-81). Kindle Edition. It is fairly obvious C.J. Mahaney lives for the spotlight – he thrives on the adulation of the large crowds at conferences. For the past three years, he has been relegated to the unglamorous life of a pastor of a small church meeting in a hotel. He has been attempting to get back on the conference circuit, but it has not been an easy task. Working against him is the fact that most decent Christians don’t really care to pay good money to be lectured to by a man who has blackmailed the co-founder of his denomination and conspired to cover-up the sexual abuse of children. However, with the aid of Christian celebrity friends such as Al Mohler and Mark Dever, and the short memory of the general public, it appears Mahaney will be “back in the saddle again” as he is scheduled to appear at the Together For The Gospel conference in April of 2016. 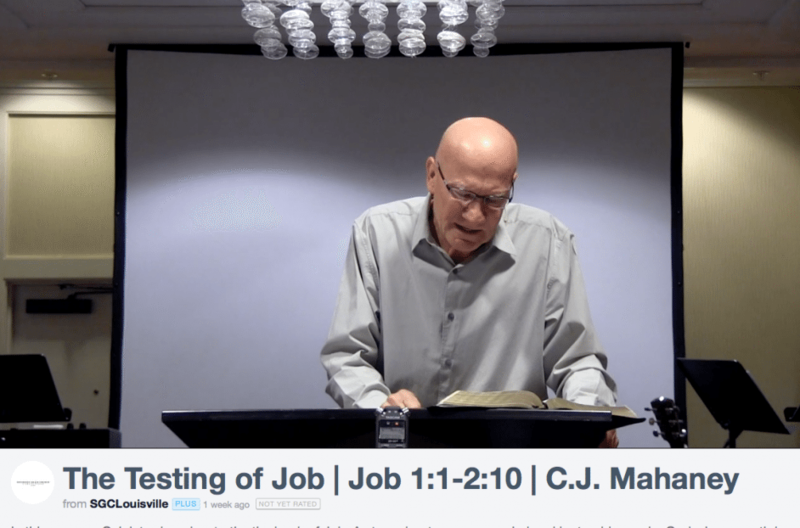 Listen below to Mahaney describe how hard your pastor works for you. Perhaps that is one of the reasons he wants to get back on the conference circuit. Preaching at a small church in relative obscurity is tough work! 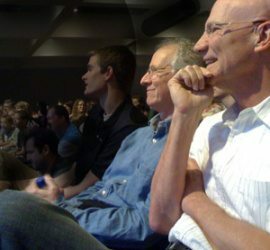 Well, at least Mahaney has four other pastors to help him shoulder the load of his small run-away church plant; and if that isn’t enough he frequently enlists the help of famous guest speakers. I guess those “hours and hours, and hours and hours and hours” of weekly sermon preparation can really wear on a guy! So let’s listen to the results of all those hours of sermon preparation in a recent sermon delivered by C.J. Mahaney. The man pours his soul into preaching, after all, as Mahaney frequently reminds us, it is the most important hour of the week and we will be hearing the very words of God. We will pick it up right after Mahaney finishes reading the Scripture. Already the guy has been choking up with emotional tears; he is still sniffling a bit, so just in case you have trouble hearing him I have included the words, taken straight from a book titled “Job” by Francis I. Andersen! Yep, that’s right – straight from the text – hard work – hours and hours and hours and hours of hard work! Editors note: I had a commenter question whether I thought Mahaney was plagiarizing Andersen’s work. 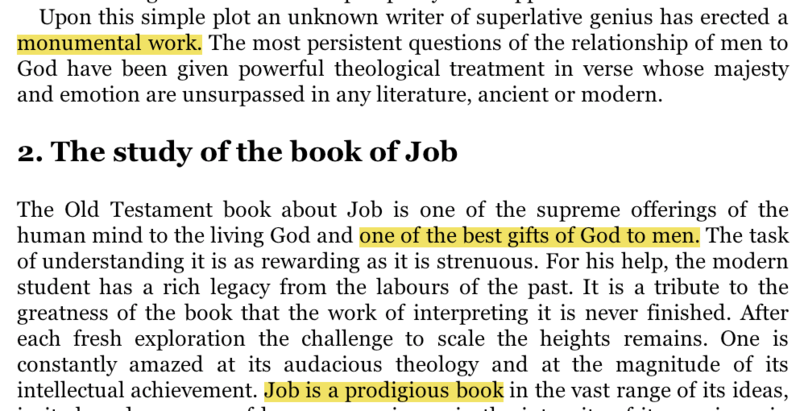 I believe all of Mahaney’s sermon above was a form of “creative plagiarism” mentioned by Eugene H. Peterson above. Mahaney never once mentioned it was someone else’s work. Then when he finishes the above section he lets us know the material below is from Andersen. I have no problem with the way Mahaney handled the material below. Check out my post titled “C.J. Mahaney Once Again Displays Minimal Effort.” I detail how Mahaney utilizes the same sermon repeatedly. I believe we have a right to expect pastors to conform to the highest ethical standards. They should be above reproach. There was a time when the majority of pastors were. Today, sadly, many are not. Unfortunately the “celebrity leaders” are among the worst offenders. 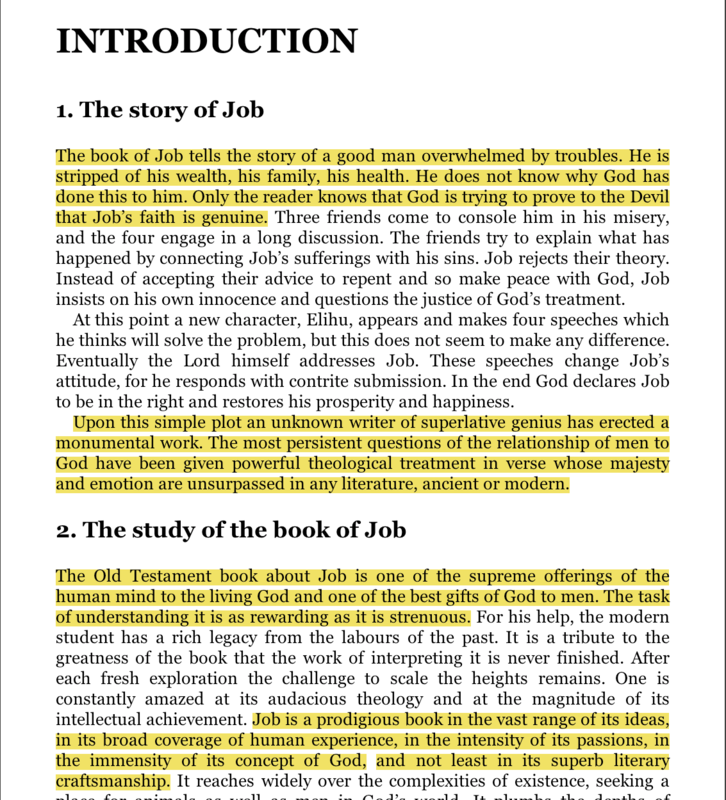 Check out my post on Docent – a company that writes sermons for pastors. Notice all the celebrities endorsing it! It truly baffles me how C.J. Mahaney can teach on passages like Phil 2 after all he has done. Sadly blind to his own sin and hypocrisy. What is worse is how so many people stand for it. YW. Merry Christmas to you. I would also add a response to Emily’s question as to whether these men are Chrsiians. IMO they could very well be and is certainly not for me to judge. I would hope that at least they sincerely think they are doing the right thing in their actions and aren’t knowingly doing the wrong thing but who knows. Scripture warns us about leaders whose consciences are seared as if by a branding iron. There can also be a pride issue of not wanting to admit one has sinned especially when the consequences of admitting sin can be quite rough include financial. It is also possible that these leaders have repeatedly ignored God’s warnings and correction. With C.J. Mahaney and his teaching he appears to be a hearer but not a doer and it says hearers deceive themselves in the bible. Also I am sure many of the nefarious people in history including Adolph Hitler thought they were doing the right thing. I know that Hitler is an extreme example but just a way to make a point. I am not saying these leaders are any where near like Hitler. 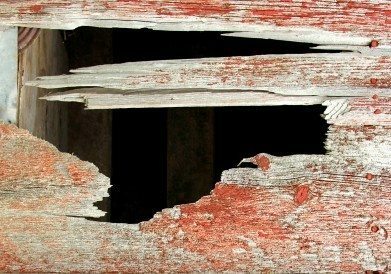 It is easy to become self deceived as the passage in Jeremiah warns us. With that said it just shocking to see how all of this has been handled with SGM and C.J. Mahaney. The documents came out and exposed serious sin and hypocrisy. Rather than deal with it and have C.J. Experience the consequences of his sin they trivialized his sin. There’s no middle ground here, folks, in the real world. Either you stand with sexually abused children or you stand with pedophiles and the Pastors who love them. This was an interesting dicussion with Emily. I am glad that there was some discussion with Emily and she shows that she can be reasoned with (I don’t mean this disrespectfully at all towards Emily). Sadly in my experience there are a lot of people that post criticism won’t discuss and reason. IMO SGM’s broad definition of gossip allowed a lot of this abuse and at best questionable actions to go on for along time. Whether it was intentional or not, it allowed leaders to manipulate regular members and for these leaders do things unquestioned. is a similar tactic to allow leaders to get away and not be exposed for questionable (at best) if not wicked actions. Be wary of any leader who teaches a broad definition of gossip or who tells you not to share and expose (at best) questionable actions to “protect” the body of Christ from reproach. Everyone have a nice Christmas. Thanks for the comment Steve. Merry Christmas to you. Thanks also for the thoughtful comments, Steve and Emily. Merry Christmas! I do not think it’s my place to judge whether or not someone is a Christian. However, I also don’t think that a person’s religious beliefs, be they Christian or otherwise, give them the moral or legal right to engage in or cover up child sexual abuse. Nor do I think that anyone should be discouraged from talking about the cover-up of any crime or immoral act on the grounds that doing so embarrasses God. I appreciate both of your responses. They were well thought out and did make me consider what I had not taken into account. I certainly did pray for those children and I do not mean in any way to discredit what happened to them. I by no means think that it is okay to cover up sexual abuse. Thank you for sharing Scripture with me. I have a thought though.. Do you believe it is possible that these men can be Christians and just very mixed up in sin? I believe people can be involved in sin yet our God is ever patient with us, working to change our hardened hearts. I will pray for this whole situation.. For God’s glory. The sentence was factually incorrect. These 3 “leaders” then changed the embarrassing statement, republishing it without any notification of having done so, an ethically questionable maneuver which they were immediately called out on. As of yesterday the amended post has been removed from the T4G website. I, too, appreciate the time you’ve taken to leave a comment on this blog even though I also disagree with what you’ve said and think it is less-than responsible to comment so strongly on a subject you haven’t taken the time to learn more about. In my opinion, your decision to try and silence Todd has put you in a position in which you’ve indirectly enabled the cover-up of child sexual abuse, which is not pleasing to God. Further, please know that C.J. Mahaney’s ongoing decision to cover up child sexual abuse is backed up by both credible allegations in a lawsuit and testimony given by his brother-in-law in a criminal case. Thus, “the horrible deeds” you’re tacitly defending are backed up by facts, not just opinions. If sorting through the written evidence to this effect seems overwhelming, please see a 9-minute video on the subject that focuses on the factual legal evidence pertaining to C.J. Mahaney’s ongoing decision to cover up child sexual abuse. If you are a believer in Jesus Christ, then you are my brother and I am your sister in Christ. Because this is true, I’m going to plead with you to stop these posts on this man and his church. I don’t know the details of the horrible situations you have said took place, but I’m sure God does not want you destroying other people who are claiming His name and preaching His gospel. How embarrassed God might be seeing us tell the world how bad other Christians are. So I plead with you.. sinner to sinner… to stop. God wants us to love Him, love people, and share the gospel. I don’t think what you are doing here is accomplishing any of that. I prayed for you. As Todd’s assistant, I want to say thanks for all the great comments on this article and especially the ones pertaining to C.J.’s early days. I’m no fan of C.J., having spent 5 years trying to address the ramifications of the child sexual abuse he covered up/is still covering up. But I, too, mourn the loss of a man who clearly once had a lot of talent and an incredible capacity to inspire people. I wish he had taken a different path. Back in the late ’80s – early ’90s, I was a volunteer editor for People of Destiny Magazine (the PDI publication started by Larry Tomczak and for which CJ Mahaney also wrote). I edited article drafts from Larry, CJ and other PDI pastors, and remember that Mahaney’s were more difficult to edit because he wasn’t a very good writer. (During those years Mahaney was an excellent speaker, however.) I wasn’t surprised to read that his books were written with the help of ghostwriters. I’ve been around PDI…SGM…since 82. I remember C.J. saying, during a message, that in high school swim practice he hid in the bleachers so he wouldn’t have to do laps. The coach, at the year end awards banquet, said C.J. had so much talent but did so little with it. It seems like he never changed. Trying to get away with as little as work possible just to get by. Thanks for the comment Jack. It doesn’t surprise me that Mahaney has been a slacker all his life. In my opinion, Mahaney plagiarized all over the place. Just an offhand, “Oh, by the way, this came from Francis Anderson” is simply not enough. Of course, preachers are well-known for lifting examples and stories from each other and passing them off as their own. Where this becames problematic is if Mahaney were to republish his sermons in book form. If he fails to acknowledge what he took by setting it off in quotations and providing the appropriate citation to author, book and page(s), that is plagiarism. That said, I am an ex-lawyer and lawyers are known for citing authorities like crazy in briefs. But still, I’ve seen historians get raked over the coals for less than what’s shown here. Thanks, Mirele. I’ve seen 9th graders get raked over the coals for less than what’s seen here. I wonder how many other times Mahaney has done this and not gotten caught? As the saying goes for every rat you catch you know there are a number you didn’t catch. Mahaney has called himself a book worm. I really doubt he has that many original thoughts if any. Most are from what he reads. BTW, from what I remember Mahaney sharing he wasn’t much of a student in high school. I think Todd’s probably asleep in Dubai so I hope you don’t mind me chiming in regarding the plagiarism issue you’ve brought up. People close to SGM have maintained that the organization either paid ghostwriters to completely write C.J. Mahaney’s books and blog articles or at least heavily edit them. I think that’s true given the difference in quality between his ad hoc sermons, like the one above, and his books and blog posts. Mahaney’s sermons are very sloppy but his books and blog are relatively sophisticated and polished. Maybe Todd will have more information for you. That is what I have heard also that Mahaney uses “ghost writers” for his books. These writers use concepts that Mahaney has taught in his sermons and then expands on them. One person who now doesn’t think very highly of Mahaney says that for speakers it isn’t that unusual this type of setup. One thing that concerns me is that SGM apparently has this writer on staff and pays their salary but then Mahaney gets the royalties off the books published under his name. I agree with your general assessment, Steve. I’ve done research into SGM’s finances and believe that its leaders engaged in a lot of financial improprieties, including paying writers to create material for individual Pastors without requiring them to give a portion of their proceeds back to the organization. That’s certainly unethical and could possibly constitute fraud given that SGM has to operate in a financially responsible manner, as a registered non-profit corporation. I do like your point about some less-than-ethical practices being common. That’s true but especially egregious in C.J.’s case. He’s not a secular motivational speaker for whom the bottom line can justifiably be money; he’s a Christian Pastor who should be acting with compassion and integrity. If local Churches and SGM are pressuring families of 6 making $50,000 a year to tithe 10% of their income, then C.J. Mahaney can take a few hours out of his life to write a sermon. Based on his body language and facial expressions in the video, I don’t think C.J. even reviewed the material he was plagiarizing prior to preaching. And that begs the question, does he really care about the Spiritual welfare of his followers or is he just a secular business person running a Christian-themed corporation? If you have details of SGM’s finanical improprieties as you indicate then maye you can share these with Todd and he can blog about them here. I am sure there are some questionable practices. It is really sad if they are demanding families tithe and then misspending these dollars. On top of requiring a tithe they would typically encourage giving offerings on top of that. SGM Leaders should have been thankful that most members tithed but that was never good enough. They wanted even more. Thanks, Steve. I’ve actually wanted to blog about SGM’s financial improprieties for some time. The problem is that I have to do triage regarding SGM/CLC issues, and much of my time is spent doing behind the scenes work with the community. For instance, the present CLC Pastors are almost certainly still letting known pedophiles wander around looking for victims because if the Pastors turn them in now they’ll likely face criminal charges for not having reported sexual abuse when they first learned of it. So I do as much as possible to keep people in CLC’s vicinity away from the place. After CLC fails financially, which it will soon, I’ll be able to blog about comparatively less pressing SGM issues. P.S. – Let me be clear that I have little insider information. Most of my research is based on publicly available information like discrepancies between SGM’s financial statements and things certain people have informally said about how projects were financed. Nice but sad find Todd. As you have pointed out Mahaney also uses a lot of “canned” sermons of his but still claims that coming up with messages takes all this time and hard work. It is too bad that Mahaney has never worked a real job. If he did then maybe he would have an idea of what real hard work is and not think that he works the hardest. He has no clue. Thanks for the comment Steve. You express my sentiments. As you may recall several of us were discussing this subject on sgmsurvivors.com a few weeks ago. Many of us who attended SGM churches were working full-time jobs (with overtime in my case) and expected to attend Care Group meetings during the week, help fellow care group members move, attend the various conferences, have a date night with your spouse, attend youth meetings with your child, “serve” at an Alpha course, come early and stay late to the Sunday service for various tasks, etc. We barely had a spare minute. Yet we were constantly reminded how hard our pastors worked! Then I heard, as part of the discussion on SGM survivors, that staff were credited with time spent working at weekend events and given time off during the work week to make up for it! Incredible. I had a good heart (most of the time) while participating, and hopefully I was honoring Christ in all I did, but looking back on it now I think I was extremely gullible. Todd, I’ve been very gullible at times in my life, as well, and sometimes feel badly about that. These leaders also get a day off during the week that none of us typically get with our jobs. I am sure they have a lot more liberty to take time off and do things during the week than most regular working people have. Hey Todd, help me out here. Preaching style preference aside, CJ did give credit to Francis Andersen for the passage so it’s not like he’s plagiarizing. What is the main problem? Just that he incorporated such a big chunk of someone else’s writing in the sermon? I submit the guy is lazy and deceptive. Thanks for the clarification and see your point since when I quote in sermons, the citation is given first before reading just to be clear. That being said, I haven’t heard enough of CJ’s preaching to know of how he puts them together or uses his time. Appreciate your faithfulness in pursuing truth. Thanks for your comments PT. I see from your last comment you are a pastor. If you have attended a Seminary am I correct in assuming they do give some instruction in properly attributing quotes whether it be in a sermon or writing? I am no scholar, but I did attend Moody Bible Institute for one year and a small Bible college in Washington for another year. I received instruction on the subject from both institutions. Todd, I have a question along the lines of what you’ve asked PT. C.J. Mahaney has always bragged about being successful despite barely graduating from high school so his ignorance respecting plagiarism might be understandable. However, even if C.J. Mahaney didn’t have the educational background needed to fully understand the nuances of the plagiarism he committed, couldn’t many of the better educated people around him have given him a heads up about citing sources properly? Mahaney appears to have a reputation for being sensitive to criticism. Is it possible that his followers are afraid to speak up if they they think he’s making a mistake of any kind? If so, does that reflect on his general leadership abilities? Great point Janna. C.J. was (and still is) surrounded by some highly educated men. I believe Purswell, Harvey and Detwiler all have Masters degrees from seminaries. I will have to ask Detwiler about that. These men knew that to give critical correction to Mahaney could cost them their job, and in the case of Detwiler it did. (A very unhealthy working relationship created by Mahaney was probably a big factor in many of SGM’s problems.) 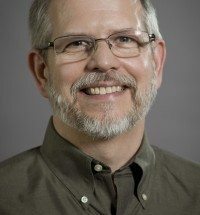 But I would think that scholars such as Dever, Mohler and Piper could offer some constructive criticism to Mahaney and he would be more likely to receive it. As you know I also attended a 9Marx church in Dubai (what does that say about my discernment?!) which I quit a few years ago. One thing they did that I believe was wise was to have a meeting during the week to offer constructive criticism of whoever preached at the church service. I do not know if Mahaney does this or not. Thanks, Todd. Brent Detwiler does have a Master’s Degree and he certainly knows how to cite sources correctly. I, too, would have thought that Mahaney’s better educated friends, whom he considers equals, could have coached him on how to write a sermon. It also occurs to me that avoiding plagiarism is discussed at length in High School, which Mahaney did attend. And everyone has bad days. However, Mahaney’s contention that he spends many hours a week laboring over the sermons he writes is simply untrue if they’re all nearly identical. I agree with Todd, PT. Any English 101 teacher would tell you that C.J. at least committed inadvertent plagiarism by not clearly stating, at the beginning of his sermon, that he was quoting someone else’s work verbatim. In fact, many people probably wouldn’t even catch his vague reference to Francis Andersen at all and think that C.J. was reading a sermon he actually wrote. C.J.’s main problem is that he’s a lazy fraud who covers up child sexual abuse in exchange for money, in my opinion. Thanks, Todd. This article helps prove that C.J. Mahaney should not be considered a professional paid Christian Pastor. He’s just an especially lazy garden variety fraud running a Christian-themed business. I imagine it was nice while it lasted, C.J. I hope to see you working on your sermons in prison sometime soon. Hey Buddy!, I found this information for you: "C.J. 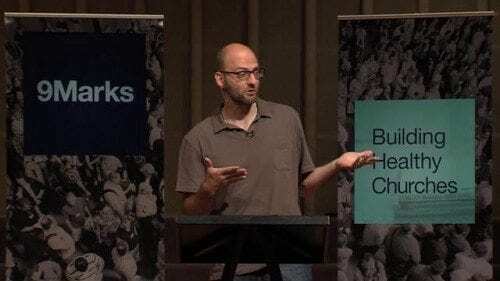 Mahaney – Doing the Hard Work of Sermon Preparation?". 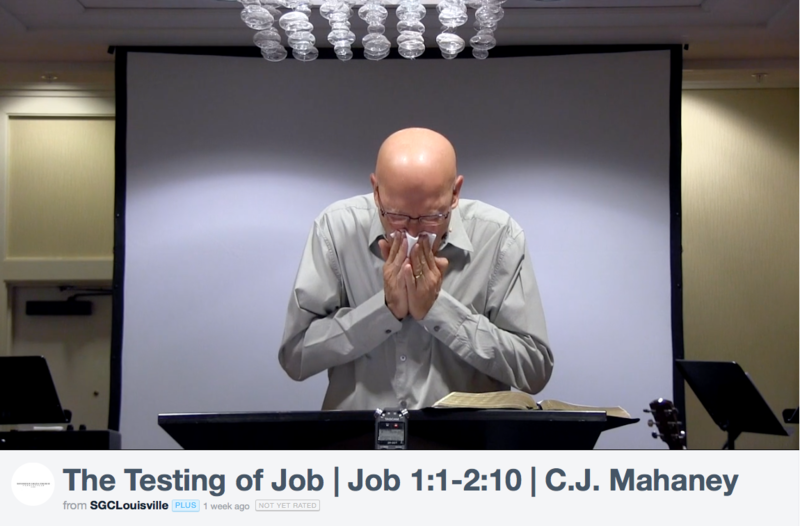 Here is the website link: https://thouarttheman.org/2015/10/07/c-j-mahaney-doing-the-hard-work-of-sermon-preparation/. Thank you.